Earn $3.89 in Rewards credit (389 points) What's This? Don't be afraid to test the waters. Waterproof socks are a bit on the nontraditional side of wet-weather cycling accessories. The uninitiated fill their heads with images of unbearable clamminess and spongey feet. But they'd be wrong. Showers Pass's Crosspoint Wool Socks might just change the way you train during the wet season, or at least, change how you feel about getting out there when it's coming down. 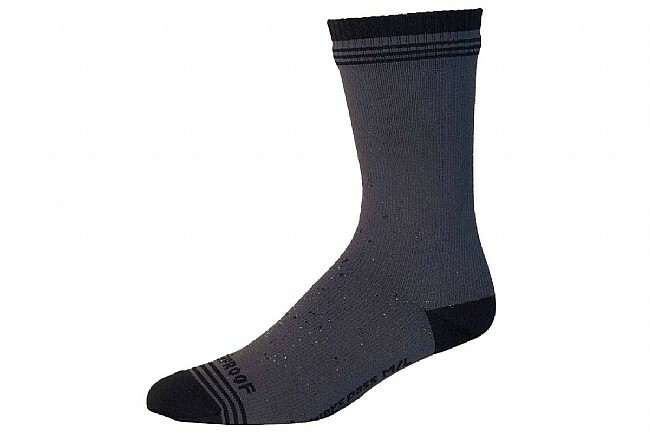 These waterproof / breathable socks feel like normal socks thanks to a durable knit exterior and moisture-wicking antibacterial Merino wool liner. Sandwiched in between these two layers is the real workhorse, the Artex waterproof membrane that'll let your feet still breathe while keeping out rain and road spray so well that you'll be shocked how warm and dry you are at the end of your ride.